The Brown-Tail Moth is found in considerable numbers along the coast of South Eastern England and can be a problem in the Brighton & Hove area from spring to summer. In spring the caterpillars become active and may be seen on the branches of trees and shrubs. They are between 7mm and 38mm in length (depending on age), dark brown in colour with a distinct white line down each side. 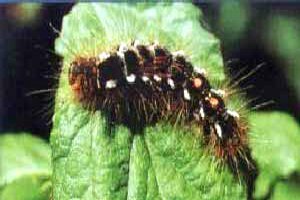 The whole body is covered in tufts of brown hairs and two distinct orange/red dots are noticeable on the caterpillar's back towards the tail. The caterpillars carry up to two million spiked and barbed hairs which can penetrate skin, causing an irritant reaction. For asthmatics and hay fever sufferers, it is important that the hairs are not inhaled as these may cause severe breathing difficulties. 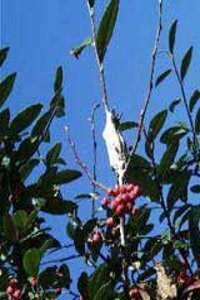 In the winter, after leaf-fall, look out for silken tents attached to small branches in the crown of your tree in which up to 2000 caterpillars may be sheltering. It is at this time that pruning out the tents and burning them can be the safest and most effective form of control. If you have an infestation in a tree protected by a tree preservation order or within a conservation area, please seek advice from us before undertaking any action. Please have a look at our Brown-Tail Moth leaflet (PDF 1112KB) which gives further information.